Climate campaigners show their support for the Vestas workers. Below is the text of a speech written by a Vestas worker for delivery at trade union and environmental movement meetings. It gives an excellent insight into the background of the struggle, and its wider political significance. It first appeared at http://savevestas.wordpress.com. See also ``Capitalism vs the environment: Wind turbine workers fight factory closure with sit-in'' for more coverage. It is currently in occupation as it’s due to close... Around 625 jobs will be lost at the three plants of St. Cross (Newport), Venture Quays (East Cowes) and Merlin Quays in Southampton (just across the water on the English mainland). There is also a resin factory called Gurit opposite us which is reliant on Vestas and is currently discussing its options, although they do not look good. Many other industries will suffer if Vestas ups and leaves and many more jobs will go. The island’s fragile economy will be plunged back twenty years into reliance upon the tourist trade with its low-paid, season jobs. We want to keep these factories open, even expand them and build new ones. But not because of our love for Vestas. Vestas bought out NEG Micon in 2003, and since that time things just got worse as it tried to squeeze the last drop of work out of everyone, sapping them dry. Long hours in a highly stressful environment and fear of repetitive strain injury amongst other conditions have given it a very high staff turnover. It is extremely anti-union and some workers who have joined unions in the past have been singled out and fired on various grounds. The nearest thing to a union is a consultation network imposed by European law, where supposedly elected representatives (but in reality hand-picked by management) attend meetings where they have no input whatsoever, and are forced to simply absorb and relay management diktat to the rest of the workers. The workers have been given an offer of a pitiful redundancy payout for all their years of conscientious labour, and this has not even been confirmed in writing. This is classic of these multinationals, and the feelings of everyone on the Isle of Wight are running high. Everybody threatened with unemployment for no reason other than one or other corporation’s desire to move their capital around the world, or find the cheapest sources of non-unionised labour, or the newest set of government subsidies, is by necessity obligated to take action and stand up with their brothers and sisters, or else fall by the wayside and be complicit in the exploitation of them and theirs. A change in mindset is spontaneously taking place all over the world, from South Korea to Enfield, from Paris to Chile. For too long have the corporations imposed their will on the common worker and driven them down without a care for their personal security and livelihoods, their families and their dignity. There is a change that is happening as rapidly as we have seen. Now is the time, and achieving action is easier – far easier – than we would ever have imagined. Let’s look at how our factory occupation began. At the end of April, the Vestas employees were gathered together and told they would all be at risk of redundancy, and the factory was due to stop production at the end of July 2009. Naturally we were all shocked and upset at this news, that came out of the blue. We had been told we were the most profitable factory Vestas had! Everyone carried on working as normal; we felt powerless and confused. A few activists from Workers’ Climate Action began leafleting the factory gates and talking to workers. A public meeting was called. From this, a small group of workers formed a committee and began talking about occupying the factory to prevent closure. These workers began recruiting other workers to the plan, all the while trying to keep it secret from management. Managers heard about possible direct action and went to one of the sites to attempt to persuade workers to sign a document against any such action. Only two workers signed. We heard of this and decided to strike quickly. Meeting up, 30 of us split into three groups and slipped into the factory unopposed. Working quickly, we secured our chosen area – the management and administration offices at the front of the building. We had successfully outflanked the managers! We had an ex-union legal man outside who liaised with the police and managers, reminding them of the law and that this was a peaceful protest. We spent the first night sleeping in three-hour shifts. The next day the crowd started to gather outside; workers coming to work were turn away but stayed to show us support, the crowd building by the hour. The managers and police started to give us two-hour deadlines to leave, telling us trespass was a criminal offence. We knew it was a civil matter and they would need a court injunction to remove us. We were threatened with private thugs storming the building and “being heavy handed with us”. The factory manager Paddy Weir then threatened to go to a DIY store and buy boltcutters to remove us. We laughed at him as the police told him he couldn’t! By the end of the first day, things had calmed down as the police and managers had exhuasted their threats with no effect on us. The police then promised not to storm the building after video footage of riot cops was sent by us to the media. The factory manager then appeared outside, accompanied by security guards, to talk to the media. He dipped his head and spoke into the two microphones in front of him in the quietest voice possible. Only the media could hear him, none of the workers who were pressed around straining their ears could hear a word. The workers in the crowd booed and jeered as he scuttled back inside the factory. Supplies were running low by lunchtime of day two. A big crowd had gathered outside to deliver food, demanding to be let through the police and private security lines. When they heard the police would not stop them, they rushed to us throwing food up to the balcony. On day three, a seven-foot fence was erected around the site to stop food coming in. The managers were not providing food at this point. We responded by hanging a banner out accusing the management of trying to starve us. This looked bad for them as local and national media were outside with a sizeable crowd, now in a semi-permanent camp. Then, suddenly, they announced that they would take responsibility and provide food to us. When this food arrived, however, it turned out to be peanut butter sandwiches, snack bars and fizzy drinks in minimal quantities. On day three, Bob Crow – the leader of the transport workers' trade union RMT – arrived and gave a rousing speech. He even told us of a helicopter on standby ready to air-drop food to the occupiers. At 7.30pm, an aeroplane flew low and circled trailing a banner which read “Save our jobs, save our community!” The rally now numbered more than 300, consisting of workers’ families and local supporters. At the same time, an injunction was served on the occupiers. The RMT pledged to handle this in court with its legal team. A mass demonstration has been planned for the day of the hearing – Wednesday July 29, outside the Magistrate’s Court in Newport between 9 and 10am. On day four, a march set off from Newport town centre. Six hundred people made their way up to the factory site in a show of support. Meanwhile, two workers travelled to London giving a speech at University College London to trade union officials, environmentalists and other groups. Sharing the platform was Chris Baugh, the deputy head of the PCS union, Jonathan Neale, the international coordinator of the Campaign against Climate Change, and Seamus Milne, a freelance journalist and regular contributor to The Guardian. We raised almost a thousand pounds. This brings us up to the weekend of the July 25-26. As you can see, there have been a few things that have been very important to this occupation. Number one – having a group of committed workers with the courage to take action to defend their jobs. Two – having someone with legal training immediately available on the outside, to negotiate with the police and management in the first hours and early days of the occupation. Three – using the media to full effect, providing video footage and interviews from inside the occupation. This occupation is ongoing, and the support is building every day. What we desperately need from everybody is continued pressure on both the government and Vestas to retool this factory and keep it in operation. It is the only blade manufacturer of wind turbines in Great Britain. The technology we have been so proud of developing is being shipped to the USA, where Vestas will enjoy Barack Obama’s apparently more serious and determined commitment to clean, green energy. We cannot afford to let this happen. We must stop it now. None of us involved in this occupation ever thought we would take part in anything like this. We quickly realised that we were at the centre of a perfect storm; we had a golden opportunity to seize the factory and force the issues of green energy, massive job losses and corporate responsibility into the international spotlight. We knew we had to step up and take action, as this was bigger than all of us put together. Anyone that joins us in this action through coming along and supporting us in person, online or through taking direct action themselves in their own workplace is participating in a much wider, greater movement. A movement that is truly global, sweeping across the planet and uniting environmentalists, workers and union movements as one force. The ecological movement and the trade union movement have long been divided by one’s desire to protect all jobs, and the other’s desire to scrap some and create others. Now they have come together to demand the maintenance and creation of green jobs for all. 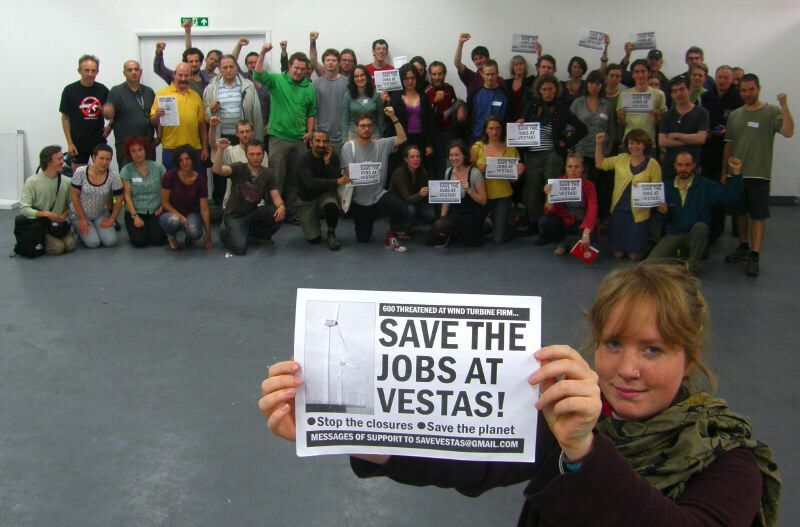 The Vestas factory occupation combines the two wills in one fight – for a cleaner, safer future. A future with jobs for all.